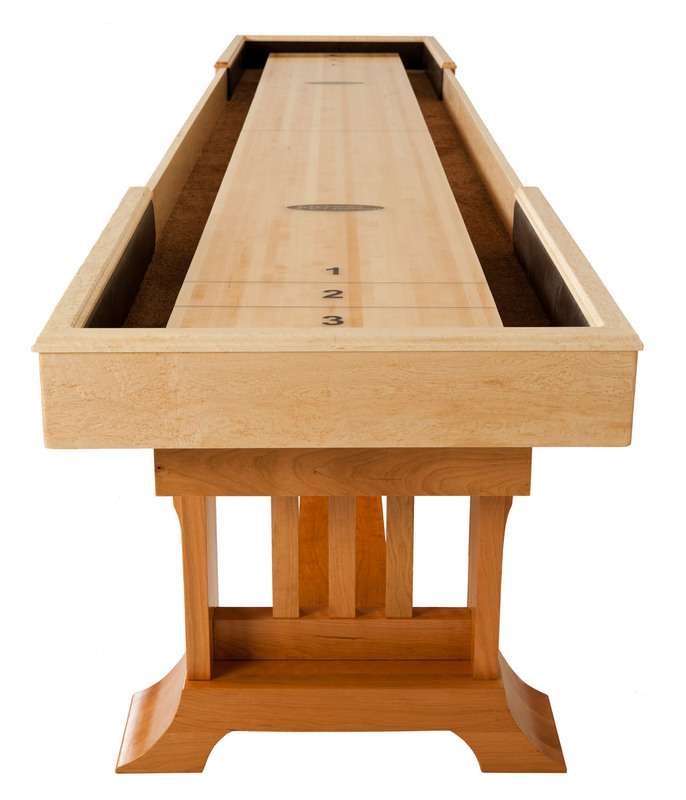 For more information about any of our Shuffleboard Tables, including inside delivery and installation options, please call 866-561-8667 to speak directly to Company Founder, John McDermott. We sell Shuffleboard Tables for the home and office, along with commercial Shuffleboards for bars, entertainment venues, including coin-operated Shuffle Boards. Give the game your best go with The Shuffleboard Federation's top-selling shuffleboard tables. These are the best shuffleboard tables for amateur and professional enthusiasts, by all of the industry's leading manufacturers, including Champion Shuffleboard, Hudson Shuffleboards, Heirloom, and Venture. It doesn't matter if you're looking for a sleek, modern table or something that pays tribute to the original boards of the game, The Shuffleboard Federation's assortment is all-inclusive. 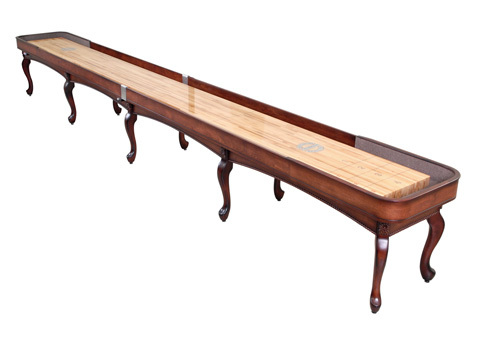 Our selection of Heirloom shuffleboard tables for sale includes the most unique, striking silhouettes and finishes that have been designed by Heirloom's founder, who is an avid shuffler and woodcarver herself. 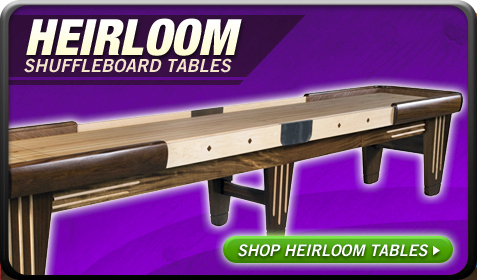 Heirloom shuffleboard tables are hand-crafted in the U.S. and feature top-quality, solid wood constructions made to honor the beauty of natural wood and the legacy of the game. The Heirloom Big Sky Live Edge Shuffleboard Table is a popular table for people who love rustic, reclaimed wood. Venture Shuffleboards manufactures game tables from the highest quality domestically sourced wood, including durable Canadian maple. These American-made shuffleboard tables come with all the bells and whistles, including a set of weights, a can of speed powder and a handy maintenance kit to help you keep the table looking and operating at its best. Our customers love the Venture Grand Deluxe Shuffleboard Table for its attention to detail and nod to the elegant Custom Deluxe Shuffleboard Table that was made by American Shuffleboard in the 1950s. We also provide a great selection of best-selling Hudson shuffleboard tables, including the sleek and sensible Hudson Metro Shuffleboard Table that features a contemporary, streamlined silhouette that's designed to complement any modern décor. Tables like the Metro can be custom-made to your specifications and feature Hudson's top-notch game play features, like climatic adjusters and 3-inch thick playing surfaces. Hudson tables are known for their unique horse collars, which are milled from a single piece of solid wood. 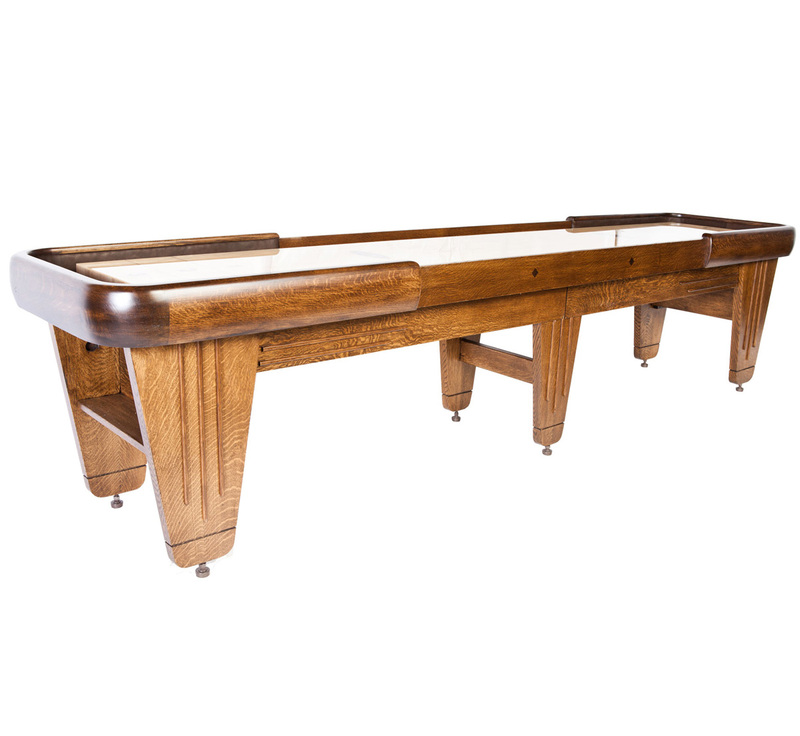 If you're in the market for a professional, coin-operated shuffleboard table for your home or business, you'll want to peruse our great variety of Champion shuffleboard tables. Although not all of their tables are designed to be coin-operated, they are the best manufacturer if you intend to place your table in a busy, commercial environment as an investment. 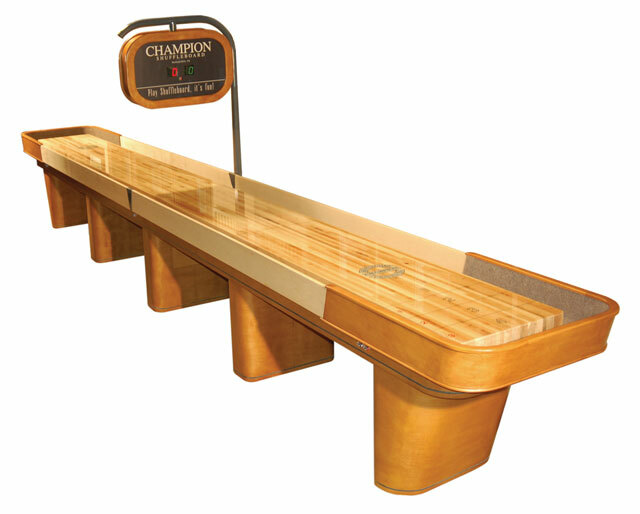 The popular Grand Champion Shuffleboard Table is exemplary of Champion's fine craftsmanship, with its solid Canadian maple playfield, red oak veneer cradle and legs that feature inlaid maple details. 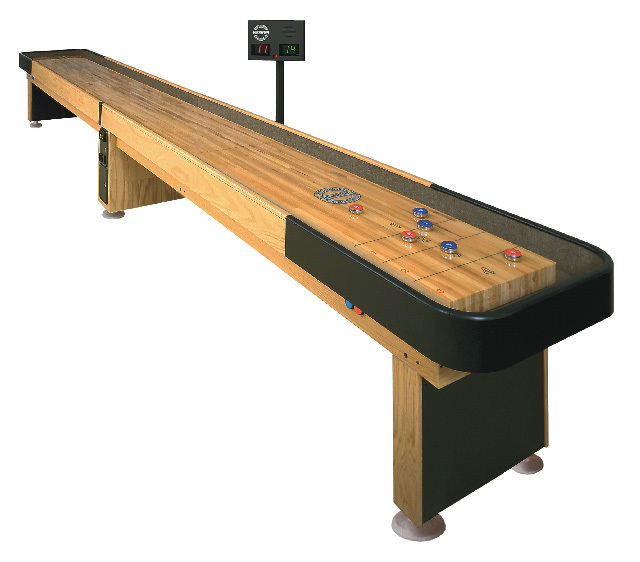 Most of these manufactures offer various table options that can be ordered in your desired size, including the official shuffleboard size of 22 feet long and smaller - like 12 or even 9-foot - shuffleboard tables. Most of these tables can also be fitted with a coin-operated mechanism, scoreboards, light kits for nighttime game play, pin gates and a two-piece playfield, if desired. Featuring a low-price guarantee, Shuffleboard Federation is devoted to keeping your gaming needs under budget no matter your preferences and requirements. 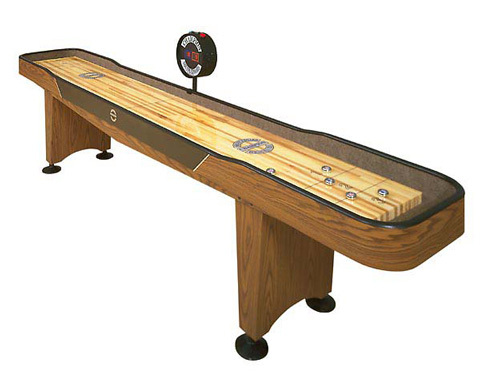 We specialize in shuffleboard tables for sale that can be customized to your liking. Bar and arcade owners continue to patronize The Shuffleboard Federation because we can personalize your table using a richly rendered, full-color logo. This is the ideal option for bars, restaurants and leagues that want a table that's all their own. Be sure to contact The Shuffleboard Federation today at 800-380-3033 to learn more about custom shuffleboard tables.